The Eight Fold Path of Yoga looks deeply into the morality of living. It consists of: Yama (self restraints), Niyama (self observances) Asana, Pranayama (breath techniques), Pratyhara (withdrawal of the senses), Dharana (concentration), Dhyana (meditation) and Samadhi (identification with pure consciousness). Yoga can be traced back 5,000 years as the science of realization developed as scientific techniques, not just a religion. Many throughout the world since the 1800's have been practicing the ancient science of Kriya Yoga. The Pranayama Kriya Yoga technique that is mentioned in the Bhagavad Gita and by the leading exponent of Yoga science Patanjali, in the Patanjali Sutras was revived by the great Babaji in the 1800's which had been lost in the dark ages. Lahiri Mahasaya was the first modern Yogi that Babaji picked to disseminate the Pranayama teachings. Paramhansa Yogananda was chosen to bring this highest science to the west in the 1920's. There is a sense of mysticism attached to the land of Thailand. There are many aspects that make it an enigma and yoga and meditation procedures and the different yogic postures seem to add on the charm of the land. One of the major components in Buddhist philosophy is meditation. Thailand is a country that is steeped in this religion and so meditation is a vital part of it. Meditation is carried on as a part of all religious practices that too on a daily basis for hundreds of years. Meditation helps to counter worry and stress and so more and more people are reverting to meditation. Thailand is the best option as there are numerous meditation centers all around the country and the there are courses that cater right from the beginners to the advanced courses. Thailand is the best place for yoga as well as there are innumerable yoga centers as well. Yoga brings about a calming effect on all the turbulent aspects and the currents of the mind. The yoga in Thailand follows this basic definition given by Patanjali in the Yoga Sutras. 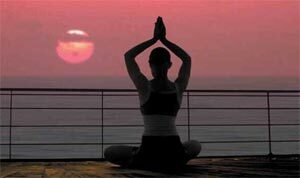 Yoga helps to bring about relaxation, stress control, a healthy mind and body along with glowing skin. Meditation is a major component of Buddhist philosophy and in Thailand meditation has been carried out as part of religious practice on a daily basis for hundreds of years. These days though, scientists recognise the benefits of meditation as a vehicle for countering stress and worry, and as a result many people practice meditation divorced from its spiritual content. Whatever your reason for meditating, there is no better place than Thailand to take the ‘inner journey’. Thailand has a range of mediation centres around the country. Many are related to mainstream Buddhist temples and sects, while others are privately owned and may focus more on issues of well-being than the spiritual. Classes are available in English and cater for a range of experience levels from Beginner to Advanced. The same course structure applies to all of our intermediate and advanced classes. They normally hold the second and third levels of the course monthly, and intermediate / advanced levels twice per year (check Calendar for complete course offerings). Students join us as their time and means allow, studying perhaps two months with us over winter, then they return to work in their home country and plan to synchronize with successive course levels during the following year’s holiday. In this way, a student may progress through the curriculum conveniently and easily.